My saint's day is Candelaria. Traditionally, this is the name my parents where supposed to give me at birth. Alternatively, I could have chosen it as my new name when I was confirmed at age 15. I didn't. I thought it was way too old-fashioned. Candelaria was old-fashioned. I has a long, rich history both in my family and as part of the centuries old celebration of Christmas in Mexico. My name, Alicia, didn't have much of a history. 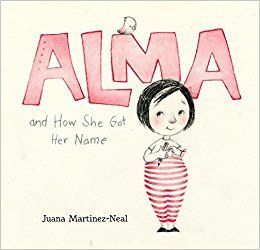 Alma and How She Got Her Name, a picture book written and illustrated by Juana Martinez-Neal, is about a little girl who is frustrated with the length of her name, Alma Sofia Esperanza Jose Pura Candela. It never fits when she tries to write it. Alma complains to her father who proceeds to explain to her the meaning of each of her names. Each name, Alma discovers, is an essential part of who she is. We like to think of names as having meaning. You can google the meaning of just about any name under the sun. Alma celebrates meaning in a different way. Meaning in this picture book doesn't come from the mean of the word, rather from the lives and experiences of the people who came before her. Their good parts--their dreams, talents, and passions--find expression in a little girl who is their name sake. Alma and How She Got Her Name is a lovely tribute to family and the love and possiblity that travels through generations.